The Para-Commandos are the US Special Operations Command's premier aerial parachute demonstration team. They perform at high visibility events across the nation, informing the public about the US Special Operations Command; the command's mission, and the contributions our 70,000 plus Soldiers, Sailors, Airmen, Marines and Department of Defense Civilians are making across the United States and in more than 70 countries around the globe. 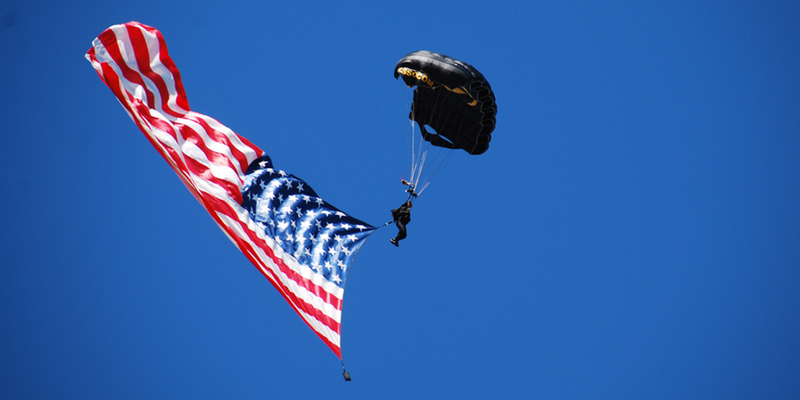 The Para-Commandos are members of and representative of today's Special Operations Forces. The Para-Commandos are comprised of active duty Special Operators, such as Army Special Forces, Army Rangers, Navy SEALs, Air Force Combat Controllers and Marine Raiders. In addition, the Para-Commandos have a number of support personnel, commonly referred to as Special Operations Enablers. Our enablers come from all four services, and include reserve forces as well. The Para-Commandos tailor each performance to the individual venue, and can perform from as low as 2000 feet above ground level to as high as 13,500 feet above ground level. Depending on the venue and time of day, The Para-Commandos may jump flags, smoke, sparklers, or a combination of each into the event. The Para-Commandos are proficient in both free fall and canopy formations; and specialize in landing on time and on target in front of the crowd!